October 31, 2018 – Hitendra C. Upadhyaya, MD, a specialist in cancer and blood disorders, has joined the Englewood Health Physician Network and Englewood Hospital. Dr. Upadhyaya’s clinical interests include hematology, oncology, hospice and palliative care, and infusion therapy, including chemotherapy and immunotherapy. He is accepting new patients at his office on St. Paul’s Avenue in Jersey City. 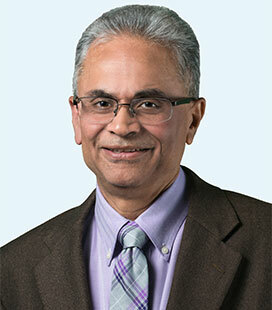 Dr. Upadhyaya is a former chief of the chemotherapy infusion center at CarePoint Health Christ Hospital and has been chair of the cancer committees at Jersey City Medical Center and at Bayonne Medical Center, and has chaired and conducted their tumor board conferences. Additionally, he has presented grand rounds and continuing medical education courses on a variety of oncology topics at local area hospitals. He is also a volunteer physician, providing free consultations to cancer patients in India. Board certified in medical oncology, Dr. Upadhyaya received his MBBS from the Maharaja Sayajirao University Medical College Baroda, in Vadodara, India. He did his internal medicine residency at Weiss Memorial Hospital, in Chicago, and a hematology/oncology fellowship at the University of Chicago Medical Center. He has practiced in Jersey City for more than 20 years. Dr. Upadhyaya is a member of the American Society of Clinical Oncology and the Oncology Society of New Jersey. He is co-author of a textbook chapter on chemotherapy for prostate cancer and has published research on a rare form of renal cell carcinoma. In addition to English, he is fluent in Hindi and Gujarati.